Having a quiet dinner on the patio? Enjoying some relaxing family time on the deck? 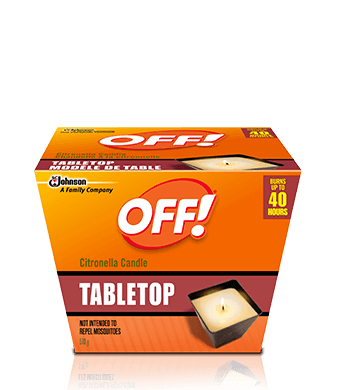 With the OFF® Triple Wick Citronella Candle, featuring up to 50 hours of burn time, you’ll enjoy even more ambiance. The attractive container can either blend into your outdoor décor or serve as a centrepiece on your table. Whichever way you choose to use it, you’ll find it is the perfect complement for your outdoor entertaining. Burns for up to 50 hours. Find the right product for when you're itching to get back out there. It’s our goal to help protect your time outdoors.